This module allows you to determine whether the particles are stationary (like grass) or moving (like rain), and you can animate this function on and off. Use the Move Module's Layer Properties panel to adjust the effect's parameters. • Age Particles: Check this checkbox to age the particles. Be aware that if you check "Move Position" and "Move Angle," then the particles will age implicitly. If you do not want the particles to move, however, and you do still want them to age, then uncheck Move Position and Move Angle, and check Age Particles. The "Age Particles" property also exists in the Baker, however whatever happens in the Baker happens after everything else in the particle system. So, if for example you have a Kill module, it will kill the particles before it ages them, and you probably want to age the particles before you determine whether to kill them. Therefore, if you have a Kill module, make sure to age the particles in your Move module before you kill them. If you age the particles both in the Move module as well as in the Baker, then the particles will age twice on that frame instead of once. • Move Position: Check this checkbox to enable movement on the particles. There is also a "Move Particles" checkbox in the Baker. If it is disabled in the Baker and in the Move module, the particles will not move, they will simply generate in place and stay there. If the checkbox is checked on the Baker, the particles will move, but if you need the particles to interact with another Action, say a Sink, then you want the Particles to move before they reach the sink. 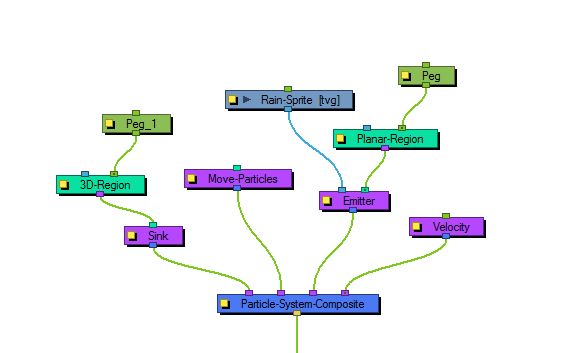 This is why you have a separate Move module, so that you can place this Move before (to the right of) the Sink in your Particle System Composite. 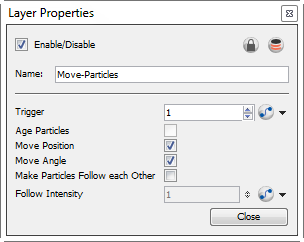 • Move Angle: Like the Move Position, this checkbox will enable the rotation of particles in the particle system. • Make Particles Follow each Other: This property allows one particle to follow another particle, through an attraction between the particles. This is particularly useful when you want to create a snake-like effect, where the particles are animating across the screen and following each other. • Follow Intensity: Adjust the strength of the attraction between particles that are following each other.